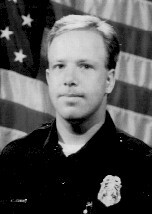 On March 26th, 1999, Officer Atkinson was following a suspicious vehicle with three male occupants in the area of 30th Avenue and Catalina. The driver lured Officer Atkinson into an industrial area where he was ambushed by gunfire and killed instantly. Officer Atkinson was a five year veteran of the Phoenix Police Department. He was survived by his wife, and 7-month-old son.